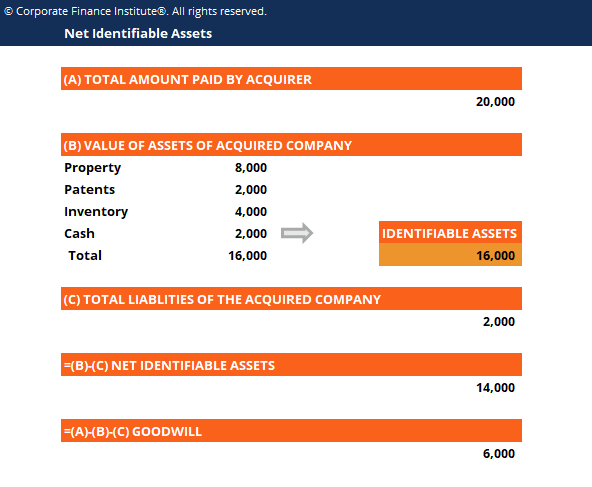 This net identifiable assets template will show you how to calculate the net identifiable assets given the value of assets and liabilities of an acquired company. Net Identifiable Assets (NIA) consists of the assets acquired from a company whose value can be measured at a given point of time and its future benefit to the company is recognizable. NIA is used for Purchase Price Allocation (PPA) and the calculation of Goodwill in Mergers and Acquisitions (M&A)Purchase Accounting – Mergers & Acquisitions (M&A)This guide will cover purchase accounting for mergers and acquisitions. In an acquisition, a company purchases another company’s assets, identifiable business segments, or subsidiaries. In a merger, a company purchases another company in its entirety. In either situation, there is a union of businesses.. The prefix “Net” here means after deducting the liabilities that also come along with the acquisitionMergers Acquisitions M&A ProcessThis guide takes you through all the steps in the M&A process. Learn how mergers and acquisitions and deals are completed. In this guide, we'll outline the acquisition process from start to finish, the various types of acquirers (strategic vs. financial buys), the importance of synergies, and transaction costs. Identifiable assets are assets that the acquired company includes in the list of balance sheet items. The asset amount that is not on the balance sheet is to be put under “Goodwill.” The amount of the goodwill is relative to the amount that an acquiring company paid and is essentially based on the perception and assumptions of the acquiring company. This is the reason that GoodwillGoodwill Impairment AccountingA Goodwill Impairment occurs when the value of goodwill on a company's balance sheet exceeds the tested accounting value by the auditors resulting in a write-down or impairment charge. Per accounting standards, goodwill should be carried as an asset and evaluated yearly. Companies should assess if an impairment is is not considered a part of Net Identifiable Assets.